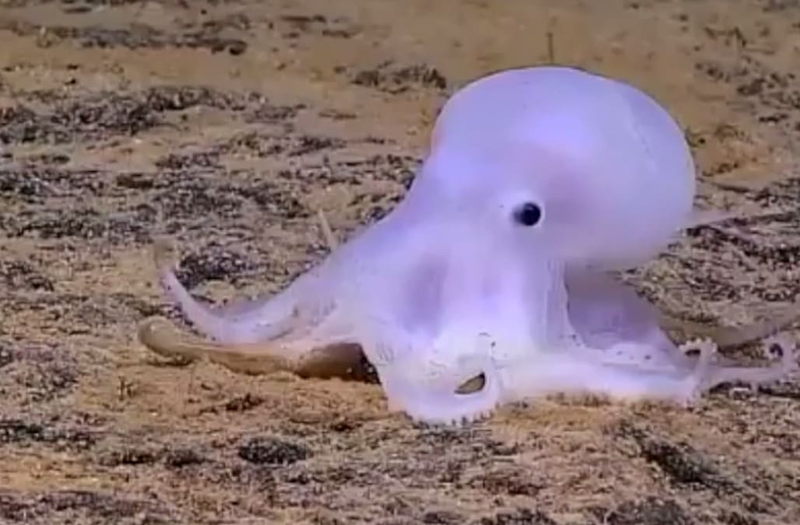 A new study documents the discovery of an octopod that looks like a "cartoon ghost." As the Washington Post reports, the NOAA Okeanos expedition team has spotted the creatures over the past few years in approximately 13,000-foot-deep waters near the Hawaiian Archipelago and the Peru Basin. Further study resulted in the identification of 2 new species consisting of 29 total members. The paper goes on to state that "the majority of individuals we observed were of the 'Casper' morphotype." It then explains that "the lack of chromatophores in this morphotype gives individuals a partially translucent appearance, reminiscent of the cartoon ghost." Researchers warn in the study that these octopods could be vulnerable to habitat loss due to the potential mining activities in the area.